Discovering the meaning of salvation in Christ Jesus, is found in these words spoken by Him, as recorded in the third chapter of the Gospel of John. We should pray to understand exactly what God meant when He said this- if we would have eternal life. Again, Jesus said, "Ye must be born-again", and that requirement for entry into the Kingdom of God cannot be over emphasized. Where you will spend the next 50,000 years and beyond into eternity, depends on whether or not you have been born from above. This meeting took place at night, probably because Nicodemus was a religious leader of the Jews would have been aware of the disdain held by his peers against Jesus of Nazareth, some of whom may have been already contemplating His death. To be associated with Jesus at this point in time was very dangerous. Today if one feels like going to church on any given Sunday, or suddenly declaring themselves to be Christian, they do so without any inhibition. But during Christ's ministry on earth, to follow Him could mean at risk-of-life. It might be interesting to note that seven of the eight writers of the New Testament were brutally murdered, with John being the only exception. This may be the reason for the meeting at night. Nicodemus was drawn to Jesus, who had already performed many miracles and spoken words about the Kingdom of God like none other. Nicodemus approached Jesus with flattering words, but Jesus immediately told Nicodemus the most important fact in life that He could share; that was- the requirement to enter into His Kingdom, which is to be born again. And that, my friend, is the most important thing that I can pass along to you. Evidently, it mattered not that Nicodemus was a religious leader of the Jews, being a rabbi and teacher of Israel. Even he needed to be born again of the Spirit of God. Therefore the practice of religion alone will not suffice as that is not God's plan of salvation. Nicodemus lacked the re-birth in the Spirit of God. 2. A Baffled Nicodemus; What does this mean? To be "born of the Spirit" is the described in the above two verses of scripture is everything you need to know about being born-again. Look again at the words of Christ; "That which is born of flesh is flesh" ...completely void of the Spirit of God. But "that which is born of the Spirit is spirit", actually given life from the Father in Heaven, by His Spirit. In step #1 we realized the holiness of God and in step #2 we saw the staggering contrast between the Spirit of God and the spirit of Man. In step #3 we saw that salvation in Christ's shed blood is the atonement for this depraved condition of man's soul described in the above passage. By the grace of God, in step #4 we saw hearts moved by the Divine influence of God, to reconsider their position and seek the righteousness of the Heavenly Father. Now-- let's understand what it means to be born of God. Here's an illustration; My name is Michael Stevenson. I am a member of the Stevenson family simply because I was born into the Stevenson family. My father's name was Stevenson, I was born of him, so being his son, I too, am a Stevenson, born and bred. My name is not Johnson, Smith, Warner, or Richman, because I was not born into those families. The same situation exist now, between God and Man in being born of the Spirit. Only those people who have been born of God, i.e., into His family, are children of the Heavenly Father. Only those born of the Spirit have His Spirit living and dwelling inside of them. Only these will be called the "sons of God" (1st John 3:2). Anyone *not born of the Spirit, is not a child of God. See here above that to be born of the Spirit, has nothing to do with the flesh, nor with the physical, but is something that God does, not Man. It is God who does the spiritual birthing- issuing and imparting His very Spirit into a brand new creation. It is your place to call upon His name, asking for this wonderful gift to be applied to your lost soul. And God has promised that all who do will be saved (Romans 10:13)! At the moment that you are born of God, His Spirit will actually take up residence within you. Your spirit becomes one with His Spirit, and is "of" His Spirit, because you have been born of His Spirit. Your desire will be to seek His will in your life, the only substance capable of satisfying your newly created soul. By God's grace and mercy- may He bring understanding of these truths to a fruitful reality in your heart... today! For God so loved the world, that he gave his only Son, that whosoever believeth in him should not perish, but have everlasting life. This is the promise of God made to you, and all who would turn to Jesus in faith and in repentence. This is salvation by grace, through faith. Understand that by the law, (keeping the ten commandments or doing good deeds or simply having church membership) no one can be saved. 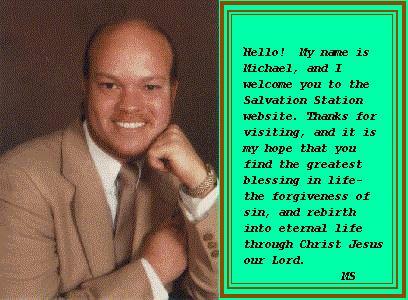 The reason is due to the requirement for shed blood for the atonement of sins. Grace is the Divine influence on your heart to draw you to this provision for salvation already in place for your receiving. Faith is believing God's word to the point of acting on that faith. Believing that when you call upon His name He will be faithful to forgive you of your sins- to wash you in the blood of Jesus- and then doing so. His Spirit will dwell in you- actually take up residency in your heart in the presence of the Holy Ghost. Believe- that *your name will be written in the Book of Life..
And now having faith in God's Word, you can be Born-Again or saved, right now! This relationship is between you, and Him. If you are not saved and you want to be, then speak to God in this prayer to Him, now. Not "repeat" the prayer but pray to God from your heart, remembering that He said, "with the mouth confession is made unto salvation." I am trusting Jesus, your Son, as my LORD and my Saviour. Father, I believe that Jesus died for my sins, which I confess before your throne, right now. Wash me in the blood of the LAMB. I ask that you forgive me of my sins, and fill me with your Holy Spirit, that I may be BORN-AGAIN, and become your child. I receive you, now, into my heart by faith, LORD, and believe that you have saved me, because You said You would. I believe that you have written my name in the Lamb's book of life. I believe that I will dwell with you forever in your Heavenly Kingdom. Thank you dear Heavenly Father, and now I ask that you would work in my life to conform me to your image that I may serve you, and I look for your glorious coming again,to establish your Kingdom- Amen. Friend, if you prayed that prayer of faith I must call you now my *brother in the LORD and rejoice with the angels of heaven because you have been born-again and are saved. Remember this date- because it's your *real birthday. It's your re-birth day... the one that will count throughout all eternity.